Some men are uncomfortable wearing colored stones as they do not find them to be very masculine. On the other hand, diamonds are quite versatile and many men find them to be quite appealing. Diamonds are a colorless stone that look great on almost anyone. A popular choice among couples is to get matching diamond wedding rings. Even if they don't match exactly, having some resemblance between the wedding rings is a good idea. The use of diamond wedding rings as gifts is a very old tradition. Diamond wedding rings from Novori are timeless in their beauty and quality. You will never have to worry about ruining a diamond with everyday wear. The hardness of a diamond makes them not only a great aesthetic choice but also a practical one. Being as that diamond wedding rings will last well for many years, they are an excellent choice to symbolize eternal love and devotion. It is important to use jewelry that will last for the entire duration of your marriage as a wedding gift. Diamonds serve just that purpose. The diamond will have been with you through all the wonderful moments of your marriage. Diamond wedding rings are full of meaning and symbolism. 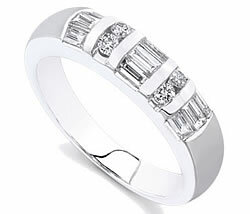 If you have been struggling to find the perfect wedding ring, a diamond wedding ring from Novori will not disappoint. As more and more people realize that shopping online is safe and secure, the number of people using the internet to research and purchase their diamonds is rising as well. Online shopping with Novori is a great way to quickly find what you are looking for without having to go anywhere. At Novori, you will have all of the information that you need about every diamond and you can even customize your diamond ring. Diamond wedding rings can be an expensive purchase; therefore, Novori lets you research your purchase thoroughly and ask us any question you have before making your puchase decision.